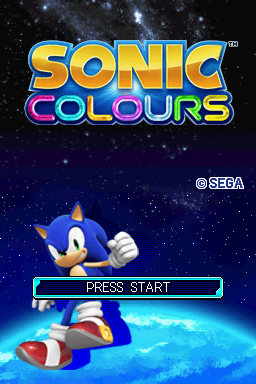 Sonic Colours, called Sonic Colors (ソニック カラーズ) in the USA and Japan, is a Sonic game released for the Nintendo DS in late 2010. In a similar manner to the original Sonic game, which saw both a Master System / Game Gear 8-bit release and a Mega Drive 16-bit release concurrently, Sonic Colours was released both as a DS game and as a Wii Game. Both games share the major plot element in that Sonic has to save an alien race from an intergalactic amusement park run by Eggman. However, they differ significantly as well, in terms of both gameplay and story. The Wii version gameplay borrows a few elements from Sonic Unleashed, but focuses more on slower and more segmented 2D areas that have more in common with early platformers such as the Super Mario Bros. titles, while the DS gameplay is more like Sonic Rush and Sonic Rush Adventure, but trades the trick system for the moves introduced in Sonic Unleashed, such as the Slide, Stomp, Wall Jump, and Air Boost. Eggman claims to have developed a sense of remorse after his lack of judgment in the past and decides to build his next massive amusement park, Dr. Eggman's Amazing Interstellar Amusement Park, in space, using the power of small alien creatures known as Wisps to power the interplanetary monstrosity. While Sonic instantly suspects Eggman's evil intentions, Tails believes he has genuinely had a change of heart. Cyan Wisps, turn Sonic into a laser, which allows him to ricochet between walls. 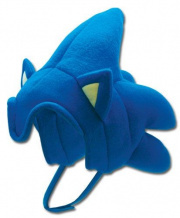 As a gift for pre-ordering the game for GameStop customers, Colours included a special hat shaped like Sonic's head. In addition, a "Special Edition" of the game released in the UK and Australia shipped with a Sonic figurine as well as three wisp figurines (white, cyan and orange in the Wii version and yellow, red and blue in the DS version). This game is notable for being the first major Sonic game to take place after the major North American cast change in 2010 (Sonic Free Riders was released slightly earlier, but the price-tag of the Kinect limited its impact). All of the 4Kids actors (besides Mike Pollock) have been replaced with a new cast from this game forward. The Japanese cast, as usual, remains largely the same since the first Sonic Adventure game. The Nintendo DS version features only one voice track in the game card and according to the regional version, due to size constraints. The Western versions have the English voice language whereas the Japanese version has the Japanese one, while the text language is entirely multi-lingual and manually selectable in all regional versions. Concept art for Sonic the Hedgehog and Yacker. Concept art for Orbot and Cubot. Concept art for Tropical Resort. Concept art for Sweet Mountain. Concept art for Starlight Carnival. Concept art for Planet Wisp. Concept art for Aquarium Park. Concept art for Asteroid Coaster. Concept art for Terminal Velocity. Concept art for Red Wisp. Concept art for Yacker, White Wisp. Concept art for Blue Wisp. Concept art for Yellow Wisp. Concept art for Cyan Wisp. Concept art for Purple Wisp. Concept art for Orange Wisp. Concept art for Pink Wisp. Concept art for Violet Wisp. Concept art for Mother Wisp. Concept art for Admiral Jelly. Concept art for Frigate Orcan. Concept art for Nega-Mother Wisp. Concept art for Nega-Wisp Armor. This page was last edited on 1 March 2019, at 15:26.